All over the internet are companies who advertise their low-cost website development, and some companies even offer free web design services. Stop and think about that though… Are you going to get a professional, high quality product for absolutely no cost? Clearly, there's going to be a catch in the end. Unfortunately, you'll likely end up with a haphazard and incomplete project or a website that is full of bugs and glitches. So, in the end, no matter how little money you spend you're still faced with lost time and costs. According to several studies, a first-time website visitor will browse for about 5 to 10 seconds before they decide whether or not to stay. Is your site user-friendly, modern and mobile friendly? If your website was built in a few hours then the answer to that question is very likely a solid "no". That's unfortunate and there's a good chance those first-time users will turn to your competition. Your website should be informative, visually appealing and mobile friendly. Too many colors, pictures and fonts create clutter and often leave users less likely to remain on your page. What's the benefit of hiring a cheap web design company if they leave you with a site that's constantly crashing or the programming was done incorrectly? 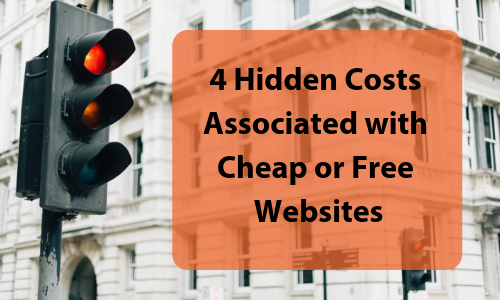 If you hire a bargain provider, chances are the site will include lots of unnecessary code. That’s because the website was originally built for different uses, not your business in particular. Essentially, you're left with problems when you add plug-ins, update hosting software or attempt to gain mobile visitors to your website. Have you ever visited a website and within seconds pop-up ads are appearing? However, many low-cost web design services are actually advertising platforms in disguise. That might not sound like a bad thing until you stop and think about the message it sends to your prospective customers. It sure makes for a bad user experience when they are constantly having to click out of third-party ads. What's worse is when they land on your website just to find advertisements for an entirely different company or industry). It's not helping your business grow if your site is possibly promoting your competition. These cheap and free website design companies are good at making their product appear attractive at first glance, which is why businesses get leered into signing a contract. However, beautiful aesthetics are only one aspect of web design. More important than a sleek, modern look is what’s happening in the background. Websites can’t function efficiently without proper back-end functionality in the forms of databases, tools and automated features, all of which are not free to accomplish. Take time to research the website design company you select and don’t be tempted to go the cheap or route. Treating your website as an investment will benefit you in the long-run, even if you pay for quality upfront. Are you ready to take your website to the next level? WebRevelation can design a new, professional website for your growing business. Call WebRevelation at 817-283-3324 and schedule a free consultation!